Physical therapy is the use of massage, heat treatments, and exercise to aid in the treatment of injury, disease, and/or deformity without drugs or surgery. Physical therapy dates as far back as Hippocrates in 460 BC, who advocated for massage following spinal manipulative techniques. But it wasn’t until 1914 when the first physical therapists, then known as “reconstruction aides,” graduated from Walter Reed Hospital right here in Washington, D.C.
Ultrasound therapy is a treatment modality used to treat pain conditions and promote tissue healing. Electric stimulators are the use of electrical currents to create muscle contractions and prevent muscle deterioration. Iontophoresis is the use of direct current to drive ionically charged medication in a solution to target tissues. Why Do You Need a Physical Therapist? Selecting the right physical therapist in Baltimore may prove to be challenging. There are a variety of facilities available across the Baltimore area to choose from. Below is a list we’ve compiled to assist you in choosing a physical therapy facility that best suits your needs. The American Board of Physical Therapy Specialties offers board certifications in 8 specialty areas. You will want to pick a physical therapist who specializes in treating your specific medical condition. Geriatric: helps manage medical conditions common in older adults. Pediatric: may specialize in helping children manage medical conditions similar to those experienced by adults or congenital conditions that are present from birth. Cardiovascular and pulmonary: helps patients with heart and lung conditions. Clinical Electrophysiology: focuses on wound management and evaluation. Neurology: specializes in conditions related to the brain. Orthopedics: diagnoses and treats musculoskeletal disorders. Women’s Health: specializes in conditions unique to women. Is your physical therapist licensed by the Maryland Department of Health and Mental Hygiene’s Board of Physical Therapy Examiners? You can enter your physical therapist’s name at the department’s website to verify licensure. Do they have a board certification from the American Board of Physical Therapy Specialties? You can do a quick search on the internet for comments from other people who have used the physical therapist or facility in the past. Physical therapy facilities are located in multiple locations. Whether you will be recuperating at home or plan on being back at work when your physical therapy sessions begin, you will want to choose a location that is convenient for you in order to reduce travel time. Check the facilities’ hours of operation; some facilities even have evening hours. Most physical therapy sessions last approximately an hour, so choosing one close to your job means you could attend during your lunch hour or set an appointment for after work, thereby reducing your time missed from work. Choosing a location and time that fit your schedule will increase the probability of you attending all of your scheduled sessions. Sticking to your physical therapy program is critical for achieving the best results possible from your treatment. Once you have narrowed your search down to a couple of places, check with your health insurance to make sure the facility is covered under your policy. You may also want to check with your insurance on how many physical therapy appointments are covered and if there is any co-pay per visit. During your search for the right facility, do not hesitate to call the physical therapy facility and ask some additional questions. You might also want to make an initial consultation to see the facility and ask some of these additional questions. How many patients does each physical therapist see at one time? Some facilities have physical therapists spend time with one patient per appointment while other therapists may see 2-3 patients at a time. Will you see the same therapist for each appointment? Seeing the same therapist will allow you to develop a therapeutic relationship with your therapist, which may be most comfortable for you. Some facilities schedule you with the first available therapist, which will afford you the possibility to learn a variety of treatment strategies for your condition. 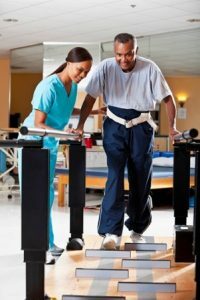 Will your physical therapy be provided by a physical therapy assistant or a physical therapy aide? A physical therapy assistant is a licensed professional who is able to assist the physical therapist with your care and treatment plan. Meanwhile, a physical therapy aide is not a licensed professional and should only be used to assist the physical therapist in preparing the treatment area and assisting patients in moving from the waiting area to the treatment area. They should never be used to provide direct treatment to the patient. Physical therapy and rehabilitation play an important role in your recovery, so choosing the right physical therapist for your needs will give you the best possible chances for a full recovery.